Though well worn, it remains a precious tale that, 500 years ago, Albrecht Dürer created a vivid woodcut of a rhinoceros not from first-hand observation but from hearsay. Now that we’ve closed the gap between the exotic and the observable, one can use Dürer’s method as an artistic strategy in order to describe the world retroactively. That strategy was manifest in Dianna Frid’s second solo exhibition at Devening Projects + Editions, in Chicago. In this materially sensitive and richly formal showing of the artist’s wall-bound and freestanding sculptures, handmade cloth books and lithographs, it is tempting to disregard Frid’s titles and simply float among her boundless, freeform abstractions, but it is the titles that frame these works, as if illustrated from a mother text. “Evidence of the Material World” was the exhibition’s name, and though the material world has not vanished, Frid re-created elements of it by interpreting found texts. Frid draws content from poetry and also from scientific treatises, which she reads as lyric, their florid language seeded with ideals for educating and inspiring readers. Comets, waves, the moon, and clouds are illustrated by the artist. Although these natural phenomena are well explained by science, they continue to charm even casual observers. And it is the constant appearance of stars, sunsets, and clouds that enables humans to measure their own perspective in relation to those who came before us. As myth gave way to science, so too will current interpretations yield to a future unknown, while the waves continue to roll over an invisible arc. As if rediscovering light, Frid finds it in reflective foil, used in many of her artworks to activate an internal light source. Like scientific texts and also poetry, Frid’s artworks are proxies for an original experience, crafted in a loose likeness and spun until they match the magnificence of that which evades capture. 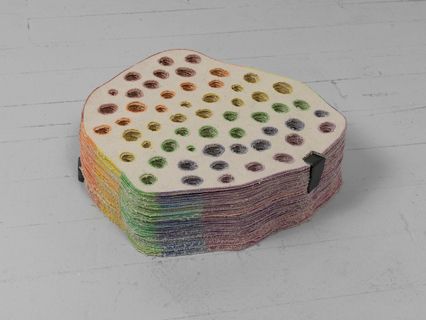 Frid detaches her materials from their conventions, such as raw linen canvas, which she uses as pages in her accordion books, or layered on the floor to make The Refulgents (all works 2011), which resembled a crepe cake in its construction and a cosmic lotus-seed pod in shape, flecked with a rainbow spectrum. The layered-canvas sculpture had a small notch removed from one side, which the artist infilled with a smooth chunk of graphite. This small surprise became visually available if you looked at the sculpture long enough, and is generally indicative of Frid’s working method, as materials guide the artist’s hand while she tailors a world of her own making. Shannon Stratton, a proponent of fiber arts and soft sculpture, has remarked that fiber art is “two-and-a-half dimensional.” Certainly one can see Frid playing with spatial perception when she uses, again, raw linen canvas for Being the Transmitter, a wall-bound sculpture that contains small wedges that slightly push the textile off the wall, producing pockets of shadow. Or, in determining the height of a pair of plaster-coated monoliths, Frid explains, in part, that they are “the relative length of two Homeric lines.” They are about the height of a person, which makes them an excellent way to keep Homer alive.